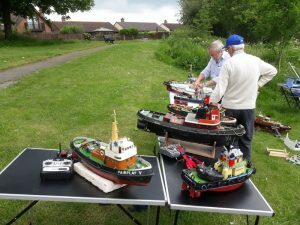 Just for a change this year our club decided to run a one-off Open Tug Towing competition and invited a few local clubs to join us. Despite the weather forecasts of sudden down pours it stayed dry all afternoon and with little wind we enjoyed pretty much perfect conditions. In fact the only need for cover was to get away from the hot sunshine! 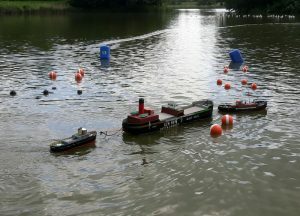 A tricky course was set to test the skippers and their Tug boat control; in places it was a little too tight so they were allowed to run into other obstacles they were not attempting and not be penalized. We had 6 teams in total, 4 from the host club, two from Shepton Mallet “Drifters” and one from the Tone Valley MBC, plus quite a few others along just to see what we were doing and to free sail their boats. Local members Chris and Mark with the team name “Education Bodgers” went out first and set the bench mark scoring just 10 penalty points around the 7 obstacle course. This despite Mark’s lead tug getting pulled over and capsizing at one point. Chris quickly decided to use his tug to push both the tanker and the capsized boat through the remaining part of the obstacle to avoid any further penalty points! Marks boat was soon up righted and they carried on to finish the course. In the end they were placed 2nd. Drifters club members Maurice and Tony going by the rather long name of “I can’t believe we’re not better!” were a bit better than the rest as they did very well and scored just 7 points. Like everyone else they scored the most on the very tight “4 square” obstacle, but this was enough to win the event overall. Sedgemoor members Russ and Arley (R & A Shipping) finished in third place with a score of 14. Just 1 point behind them were fellow club members Keith and Robert going by the team name of “The Bashers” they didn’t bash too many scoring 15 points. 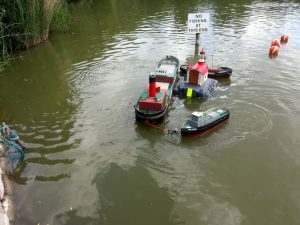 Bob and Andy (Tone Valley A Team) both entered using loan tug boats provided and didn’t do too badly considering it was the first time they had used the boats or even done tug towing before! Bob got a bit carried away on the throttle stick on the lead tug at the halfway point and dislodged his tugs superstructure. No damage was done and he borrowed another tug to complete the course. After all that they still finished on 19 points just a handful of points off a top 3 place. The second Drifters team going by the name of “The Misfits” Mike and Graham struggled to get to grips with the heavy tanker. They scored 37 points, but completed the course and even managed to sound the horn on the Lighthouse at the end. Getting all 6 teams around the course plus the odd rescue took sometime so we all agreed not to run the second course and just enjoy the rest of the sunny afternoon free sailing on the lake and enjoy an ice cream or two. 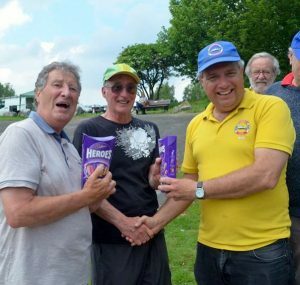 The winners Maurice and Tony were awarded their prize of a box of “Heroes” each. All in all it was a very pleasant afternoon in good company with gentle banter and ribbing lakeside, plus some very nice tug towing skills on display. It is certain our club will be doing it all again next year, but next time we’ll have two tankers so we can move things along a bit quicker and give everyone a second chance to get it all wrong!